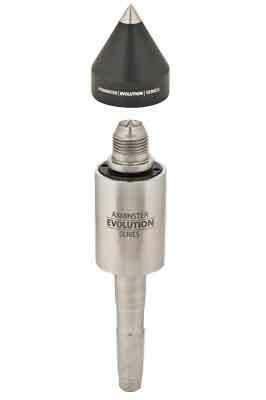 I needed a new revolving centre and having other items from the Evolution series, I decided on this one from Axminster. The product comes supplied with a small tommy bar and spanner, both made from mild steel. The quality of the centre is immediately apparent. It is made in high grade stainless steel with an aircraft grade aluminium nose cone and a replaceable stainless steel 60° tip. Available in all three Morse tapers. Out of interest, I tested the centre for run out - as you do with your brake discs to see if they are warped - with a dial indicator. This was carried out at several speeds and it was impressively negligible, even under quite a severe load. I did use a good quality Belgian version as well and the readings, although very low, were not quite as good. An old generic centre fared much worse. Axminster have made this with a double row angular contact bearing, making the unit longer than standard centres. At the rear there is a single race bearing. The cone is removed using the tommy bar and spanner to reveal a 3/4in x 16tpi thread and a ring centre. On their website, Axminster promise a range of accessories to follow - note the faceplate attachment is an optional extra - but woodturners, I have found, are a very innovative bunch of folk and know there is always more than one way of doing things. I decided to make a few accessories myself out of hardwood to finish a few projects. Again, I pushed the use of these and found the results to be impressive, running true all of the time. I tried a range of hardwoods, acrylics and industrial nylon and the tip gripped adequately. I believe there is no doubt that Axminster has yet again made a substantial tool. The bearings have been designed to take substantial loads both radially and axially. I did push this tool but time will tell as to the quality of the bearings. 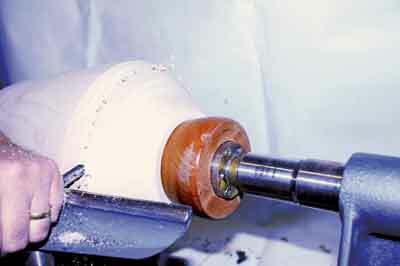 Turners with short bed lathes will notice a slight reduction of available length between centres. Accessories were easy to make and can be changed very quickly. If you use the same screw holes each time, then your accessories will run true every time. The tommy bar and spanner especially did bend easily when the tip became a little tight, but that was not really a problem to solve with other tools. However, in my opinion, for the price of the tool, they could have been better quality and stronger. All in all, a very useful top quality tool that should last for years, even if they are a little expensive, but you do get what you pay for.